Bautista, J.; Mateo, M.; De La Torre, R.
Bautista, J., Mateo, M., De La Torre, R. "Anexos para “Assignment of Volunteers in a sport event. 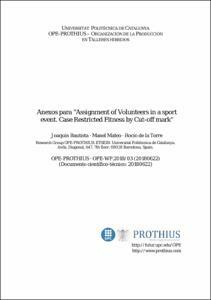 Case Restricted Fitness by Cut-off mark”". 2018.